Customers seek to be efficient with their time., This means that the amount of time they spend in your store is limited. The average customer does not walk down every aisle, go to every department, look at all the goods you are offering, or take a great deal of time comparing items for purchase. Most customers walk into stores with a predetermined (if sometimes generalised) goal in mind. No business owner wants customers to view going to their store as a chore or an unenjoyable experience. Despite time constraints, there are ways to improve the shopping experience for your customers even if time is limited. First, understand the point of view of the average customer. Most come to a store looking for a specific item or type of item. They do not come to browse or use any more time than is absolutely needed. For example, a grocery store carries a wide selection of things to buy. However, studies show that despite stores offering 30,000 to 50,000 different products customers on average buy just 300 different products every year. Also, on an average shopping trip, customers buy 5 products or less. This makes for a very short visit and information has to be presented in a way that is attention-grabbing and easy to understand. What a customer sees is an important part of shopping. As a customer's time in your store is limited you have to communicate with them in a quick and easy to understand way. This is why your POS displays are so important. This is how you communicate valuable information to shoppers. A POS relies on several design choices that catch your attention. A differing colour or shape stands out from the display around it. A POS display can be something as simple as a square sign on the end of a rail of the corner of a display. Customers come to your store with a goal in mind but may not have all the facts about what they really want. A customer looking for a jacket may not know you are having a sale on jackets that week. A well-organised jacket display with a POS sign can easily communicate this fact. A goal in improving the shopping experience is to be informative as this helps both your customers and your employees. Studies show that salespeople provide product information 87 percent of the time when speaking with customers. 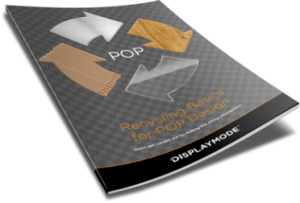 What an effective POS display does is lay the groundwork for your salespeople. It places a customer in the mindset of buying not just an item but a particular item. It also allows your salespeople to move beyond general questions to providing facts about a specific purchase a customer is now interested in. As the above information shows the shopping experience is based on a relatively small time frame. One of the best ways to improve the customer experience (and assist your staff) is through informative POS displays. DisplayMode can help you with your point of sale process by providing easy to use and innovative POS/POP displays for your business. Make no mistake POS displays are a key part of consumer marketing and should not be treated as an afterthought. Also as the above linked studies show it takes an expert to design POS display tools that are truly effective. DisplayMode understands the needs of retail marketing and understand how DisplayMode can help you a wide variety of products and services. Contact DisplayMode today at +44-(0)-1536-460805 or via email to learn more.